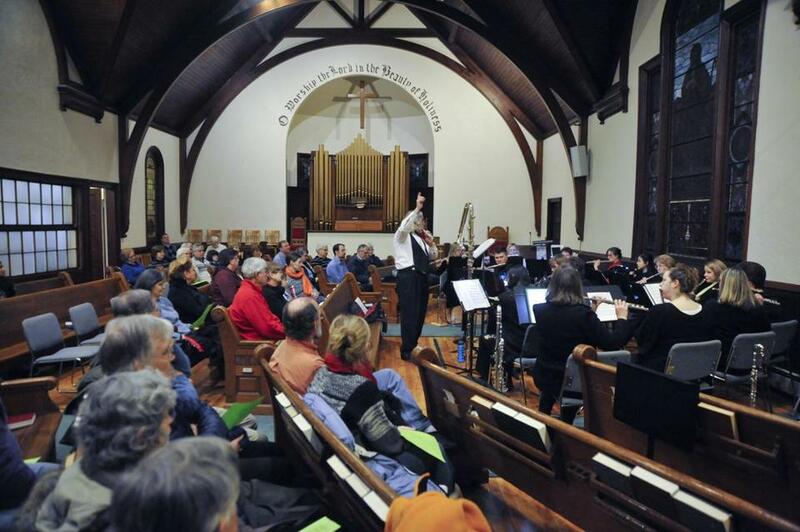 A flute concert by the Harmonie Transverse ensemble was this month’s Second Saturday activity at South Acton Congregational Church. On the second Saturday of each month, the South Acton Congregational Church opens its doors to the community so people can listen to a concert, watch a magician, or hear stories from a horse whisperer. The new Second Saturdays entertainment and educational series is not about religion or drawing new people into the congregation, said the Rev. Katrina Wuensch, the church’s pastor. Instead, it’s about using the building on School Street as a “third place’’ outside of work and home where people can get together in a social setting. In the sprawling suburbs, places to gather can often be hard to find, said Wuensch, who lives in Harvard. The next event will be held at 7 p.m. March 8 and will feature Ainslie Sheridan, a lifelong horsewoman, animal photographer, and author. Sheridan will share stories about the horses she has trained and rehabilitated through the use of “natural horsemanship,” a way of working with horses popularized in the movie “The Horse Whisperer.’’ The admission cost is $9, $16 per family, with a portion of the proceeds going toward a mule and donkey rescue organization in New Hampshire. Oldenburg believes that people need a third place to thrive outside family and their work lives. He cites coffee shops, hair salons, and bookstores as examples of third places in a community. Oldenburg said his book was prompted by the reaction of a friend from Norway who was taken aback by life in a typical American subdivision. Oldenburg said since he wrote the book nearly 25 years ago, many churches, libraries, and YMCAs have stepped up to serve as third places around the nation. Some businesses, such as Starbucks, have even promoted themselves as third places. Oldenburg said the need for a community gathering place continues to be important, especially today as people rely on technology to stay connected. But finding time and a place for that face-to-face contact can be difficult, especially in the suburbs, said George Clark, a member of the church who first suggested the idea of its serving as a third place. The idea gained traction among church members who brainstormed ways they could fill that void at a time when families are spread thin between work and school commitments. Member Gary Lacroix, who lives in Littleton, said the events have been family-friendly with a mix of church members and nonmembers. Lacroix said the biggest challenge is getting the word out and letting the community know about the events. In April, the church will host a lecture on Revolutionary War soldiers from Lincoln, and in May, there will be a Mother’s Day Story Slam where the audience will be able to share an experience about their mom or one they’ve had as a mom. After each event, participants are encouraged to linger and chat over refreshments, Wuensch said. Jennifer Fenn Lefferts can be reached by e-mail at jflefferts@ yahoo.com.